This garland makes a great backdrop behind a cake or dessert table and can be draped just about anywhere to add some color to any party or gathering. 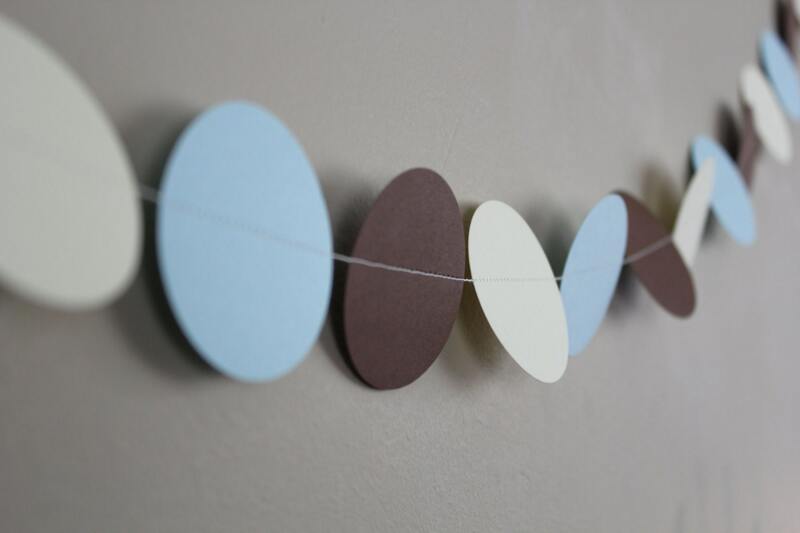 The best part is this garland can easily be folded up and reused for another occasion. 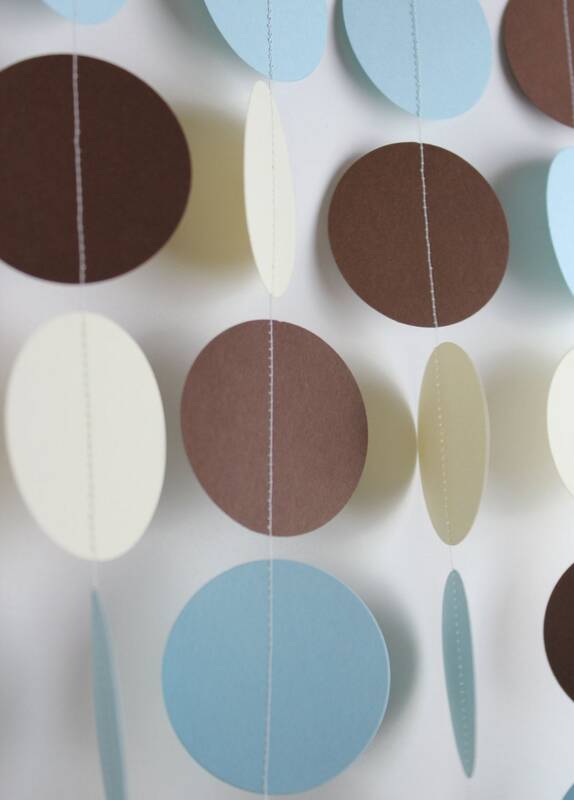 Garland is made of card stock paper circles that have been sewn together. 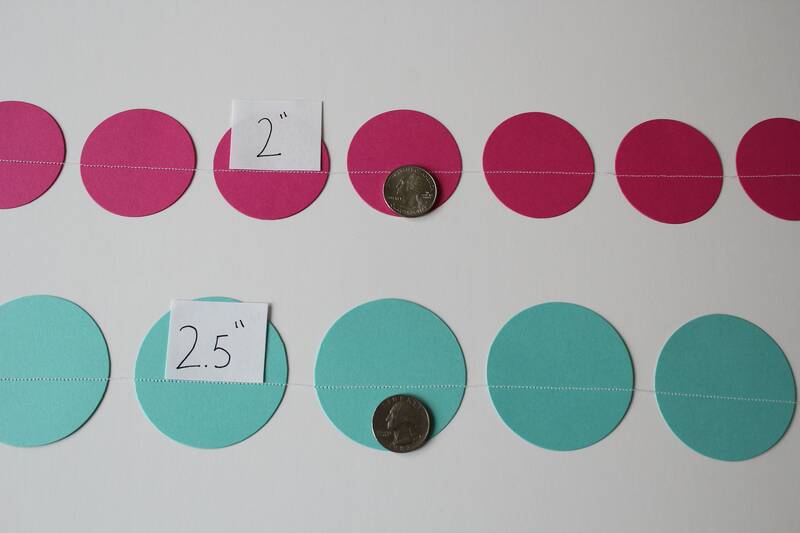 You may choose the circle size from the chart in the last photo. 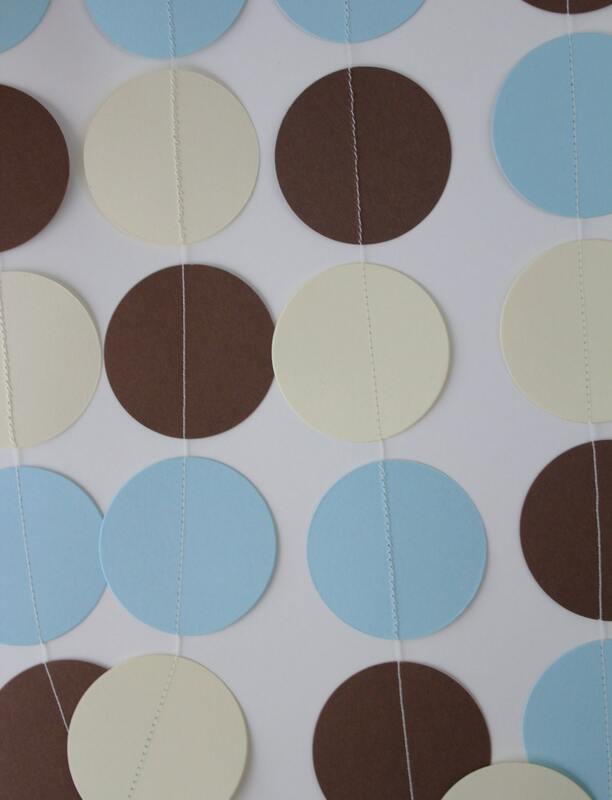 Each end of the garland has a piece of thread that can be used to tape up the garland. 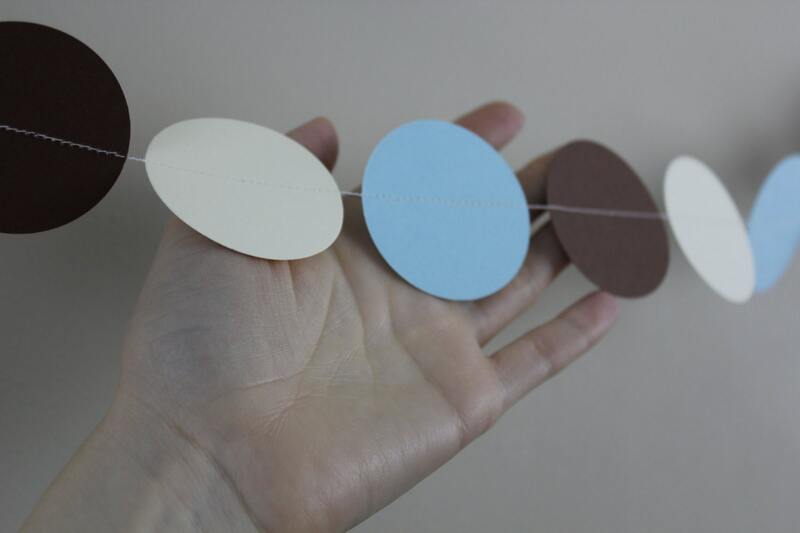 (1) single strand of garland in light blue,ivory, and brown that has been sewn together with white thread. *PLEASE NOTE: Colors may look different depending on the type of computer monitor you are viewing the item on. Not all colors of garland match my tissue paper items. 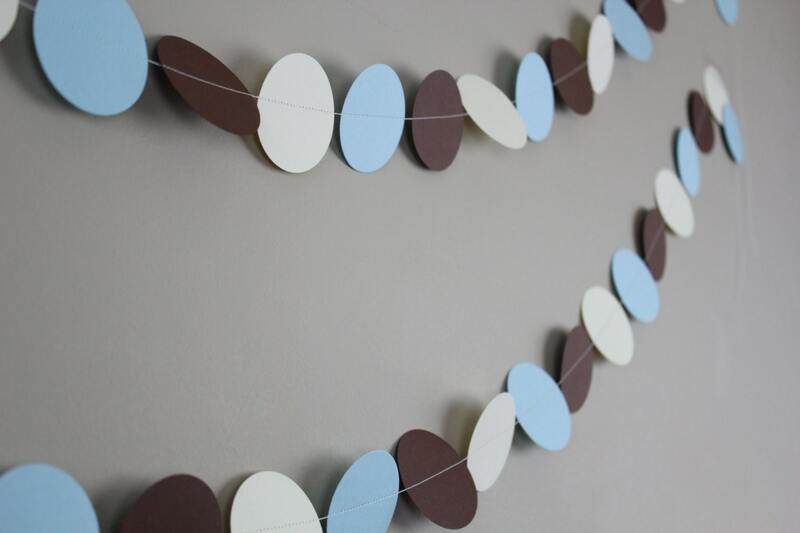 * Price is for 1 single strand of garland photos may show multiple strands of garland. If you would like custom length or different colors please contact me. I accept payment by PayPal . You can pay with a credit card via PayPal even if you do not have a PayPal account. Orders will not be shipped until full payment is received. Custom orders will not be created and shipped until full payment is received. Most orders ship standard USPS. Shipping upgrades are available upon request. Custom orders generally cannot be returned. If there is a problem with an order please contact me. Customer satisfaction is very important to me and I will do my best to remedy any situation that may arise. *Please note that my store contains a variety of the same products in different sizes and colors. Please be sure to read the item description for the item you intend to purchase as each one is unique. Due to computer monitor differences photos may not convey all colors accurately so please ask if you are looking for a specific shade of a color. Also items in my photos may appear larger or smaller than they are so please take note of the measurements in the description listings for each item.